Two-dimensional finite element analysis, considering heterogeneous and anisotropic properties of cancellous bone, was applied to the analysis of stress distribution in the natural proximal tibia before and after total knee arthroplasty. The detailed material properties of the proximal tibia were estimated by image analysis of soft X-rays. In the natural proximal tibia under bi-condylar uniform loads, which is regarded as ideal, the stress concentration was located in the middle portion between the condyles when the model was based on homogeniety and isotropy of cancellous bone. On the other hand, stress concentration was not found in analysis assuming heterogeniety and anisotropy. The stress distribution in the proximal tibia with the model of heterogeneity and anisotropy of cancellous bone was shown to be close to the actual clinical outcome. 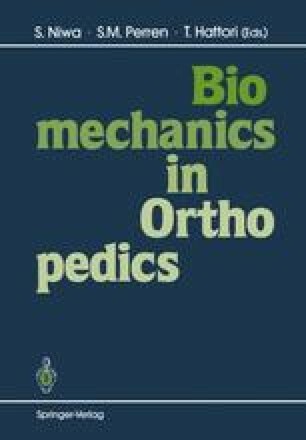 The finite element analysis employed in the present study may be beneficial in the evaluation of tibial component prosthetic designs.